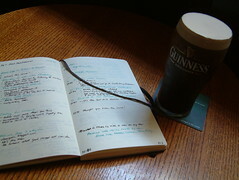 AS I BAPTISE a Bank Holiday Weekend with my open Moleskine under one palm and a fresh Guinness in another, I'm thinking about some e-mail and Facebook comments about what Ireland lacks. I've written about this thought after attending a Tipperary Tourism Workshop last week. Tipp lacks bundled tourism--a large operator cannot click into Tipp and find intelligent suggestions that extend across several days while hosting a full coachload of people in the Golden Vale, so the big operators go to Kilkenny, Galway, Dublin or Kerry where there are bundled attractions. But if you asks Google "things Ireland lacks" you get some other interesting answers that I want to validate. Google says Ireland lacks intelligent signage. It certainly does. And when the signs are up, they're often turned by people who want to confuse tourists with GPS units. For the past two years, I've noticed how much Ireland lacks in terms of family-friendly activities. Two generations ago, the toddlers enjoyed the pub. Four years ago, I saw buggies in Temple Bar pubs. Last year, one of my favourite local pubs plastered a large "No Children" sign on its front door. And there's no hope of finding family-friendly pathways linking housing estates primary schools. It's as though the county councils want yummy mammies to buy SUVs and straddle double yellow lines for the primary school days. And finally (since I need to get another pint), Ireland lacks truly high-quality cultural festivals outside of the normal summer season. Try as they might, small towns try their hands at mounting a community festival but the ones I've attended are no better than those I enjoyed with volunteer firemen during Chicken Corn Soup Festivals in the States. Good social craic, but low on high culture. That said, you kinda know what you're going to get by looking at the promotional material. Sent mail2blog using Nokia E90 O2-Ireland Typepad service between rounds in Brian Boru, Main Street, Cashel, County Tipperary.